Well, spring is arriving lots of babies. March 23: I've been keeping a close eye on all the pregnant animals and Sprinkles' udders have been filling so she is due soon. 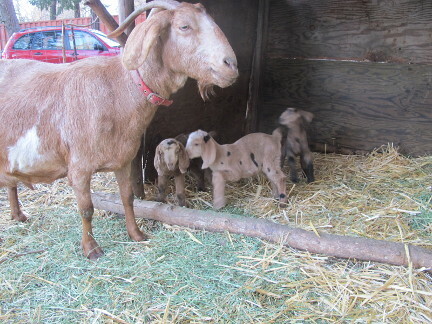 Tuesday, March 26: I headed off to The Dalles after feeding the goats and sheep only to find four babies when I returned home. Sprinkles delivered four girls with out any problems. They were all still wet but three of them were up looking for their first drink. The fourth ‒ a nearly black kid ‒ had just been born and needed some help clearing her lungs. Eventually all four were up and checking out their new digs. Goats and sheep have a uterus with two lobes so twins are normal. When there are three, they have to share and when there are four ‒ double occupancy ‒ things get a bit crowded. 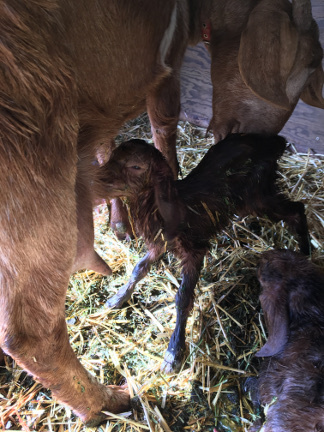 After delivery, an experienced Mom will evaluate her milk supply and the vigor of the little ones and sometimes decide not to feed a little one does and sometime one does not make it through their first night. Sprinkles was feeding all the little girls, but the black kid didn't make it through her first night. Over the next few days they have been nursing and growing. Fudge, her daughter, is looking very round but her udders have not filled out yet ‒ maybe because this is her first delivery. So on Friday, I drove up to Tacoma and had dinner with my sister. The next morning, I continued north to Seattle to pick up our first intern for this spring. Tyra and I headed to Windward and filled the drive back to Windward with lots of conversation. 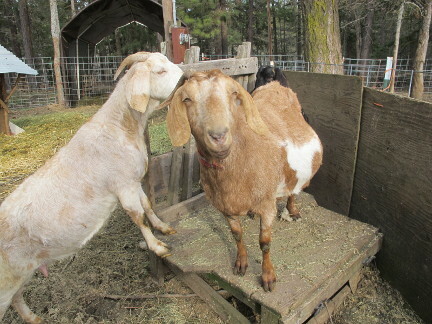 To see a video of Sprinkle and her four kids, Click Here. When we arrived, Kiri told me that we had more babies. 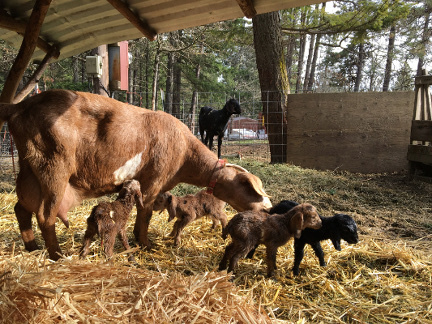 Fudge (a first-time mom) had delivered three kids. but searching in the wrong direction. This is Fudge's first kidding, so there's lots for her to learn. 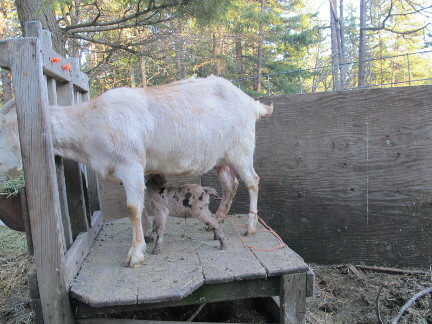 Here she is in the milking stand to help her kid get that first dose of colostrum. As you can see, the kid's got some orientation to work on before she'll find the teat. One of Fudge's kids was still born, and the third is a tiny little girl that needed a bit of help. She was still breathing but wet and cold when I found her. I put her under a heat lamp while I helped her sister get her first meal. I spent the evening polishing up my premie skills. I used a hair drier to dry and warm this little pixie. I also milked her mom and would put several drops of milk in her mouth and she seemed to be swallowing. I also put some Kayo syrup in her mouth and the sugar gave her some energy and she was more wiggley and was making the cutest baby noises. 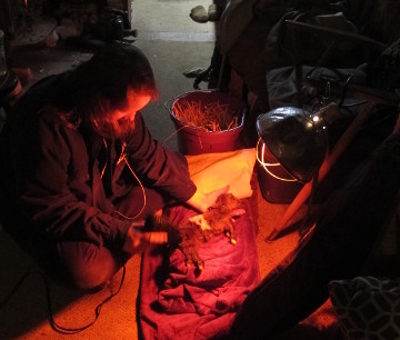 We moved the kid in Walt's trailer near the wood stove with a hot water bottle. I got her warmed up and she was getting the hang of swallowing. Opalyn warming Little Pixie with a hair dryer. Once she was warm, I heated up some milk and got about 2/3 ounce into her belly using the tube feeder. At that point, I got a shower and crawled into bed to get a nap before the midnight feeding. Walt took care of that and let me sleep until about two when I woke and went to check on her. I got some more milk in her tummy and headed back to bed. Walt checked on her later and found that while she was still warm, she had passed in the wee hours of the morning. That's the time of day when the life force seems to be at its weakest. When a situation like Little Pixie presents, we're up for doing heroic measures as a learning exercise, doing so in full knowledge that success is unlikely. It hurts to loose a little one, but it helps to know that you gave them your best effort. Today, when I went up the hill to feed everybody, I found the littlest kid on the opposite side of the pen and crying for her mom who could not get to her because the little one had managed to climb through several fences. I got everybody distracted with fresh hay and retrieved the little one. I got Fudge back up on the milk stand, placed the kid under Fudge and she dove for milk. Seems she has learned where the milk comes from. I checked on them through out the day and as evening approached, I got Fudge back on the milking stand and secured in place to let the little one have a big dinner. It seems like she had not eaten since morning and I don't want to let Fudge's inexperience cost another life.